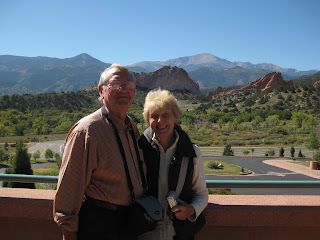 Mum, Dad and me had a night away and decided to go down South to the Royal Gorge and also to visit Pikes Peak. Both locations were worth the drive. The Royal Gorge was impressive and very empty so we managed a cable car ride across, a quick look at the wildlife park, a wonder across the actual bridge and a cage ride down to the bottom of the Gorge, coffee and ice cream all in 2 hours. I didn't get any great photo of this part of the trip unfortunately. 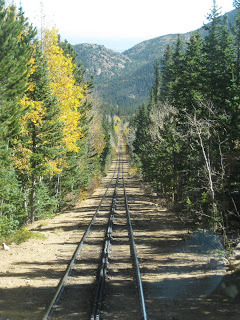 We then stayed in Manituo Springs (Old Colorado Springs) so we could get to the Pikes Peak Cog Railway by 8.30am the next day. We had brilliant seats at the back of the train and I got some good photos. There's one out of the back window showing the steep track and also changing tree colours. 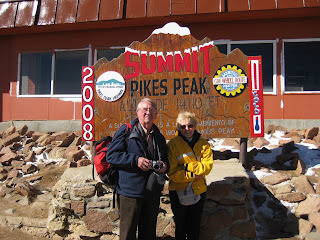 There's also one of Mum and Dad looking very cold at the top. It was strange at the summit as it's over 14,000 feet. I felt weird, a bit like a drunk feeling. I ate a Snickers and popcorn and felt better but it was the altitude. Mum and Dad were fine. It surprised me as I ski at altitude without any ill effects. On the way back to Denver we stopped at Garden of the Gods. Another impressive tourist attraction. There's a photo of Mum and Dad with the 'Garden' behind them. I dropped them at the airport this evening. We had a brilliant time with them here and amazingly we did not fall out once - that's a record for me and Dad. We're all going to miss them, me especially and am looking forward to seeing them in December. The weather's been brilliant for the past month and we are now due snow at the weekend. Good job really as Jacob has been moaning on about when can he ski again, hopefully that won't be too far away. Nice pictures! It sounds like your parents had a nice time, and you were quite the hostess. Fun, but a bit tiring, too. We don't have a complete answer on the Las Vegas weekend, yet. We've decided that we will likely go to the wedding, but then I asked Brian to check if the invitation was for us or for the family. (It was a blank envelope that Than just handed him at work). Anyway, if the family isn't invited, we might skip it. It's out of town (Sedona), so we don't really have a sitter there. But that's rambling. It is unlikely that we'll be in Las Vegas that weekend, but we'll definitely find you on your trip to Disney. Monday is a holiday, and Than will be back in the office on Tuesday. Hope your surveyor tells you good news! Soccer, Skiing and Super Heroes!